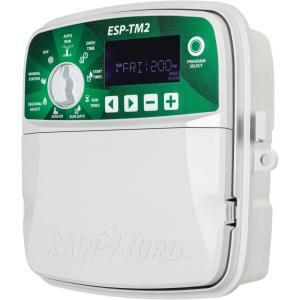 The ESP-TM2 Controller from RainBird is a great choice for standard residential use. Great water saving features are so easy to use, RainBird says you'll actually use them. This unit has the flexibility of 3 programs and 4 start times available per program, so you can tailor your watering schedule to your landscape needs. Available in multiple station models and is suitable for indoor and outdoor installation. New large back-lit LCD display for improved visibility in low-light and direct sunlight conditions. Plus, the ESP-TM2 Controller is wifi compatible by simply installing the LNK-WiFi Module (sold separately). This allows you to access, operate, and monitor the irrigation system from anywhere using your smart device and RainBird App.